Ready to learn faster, easier, and more effectively? 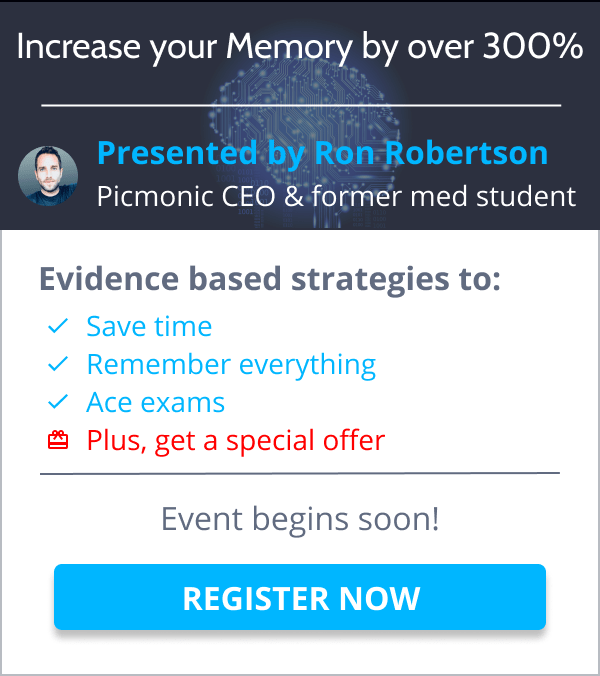 Picmonic combines unforgettable images and stories to help you learn everything you need to know as a medical, nursing, PA, NP, pharmacy, or pre-health student! Want to join Picmonic’s Visual Learning Community, but not sure if you’re ready to commit to a subscription? You can explore Picmonic Free! Whether you’ve been a member for years or are brand new, your Picmonic Free account will give you access to more content every single day. What comes with Picmonic Free? Watch Picmonic Videos: View 1 Picmonic of your choice per day. Browse our library, search for a specific topic, or watch the same Picmonic daily: you do you. Multiple Choice Quiz Questions: Each Picmonic contains a Quiz. You can test your knowledge on up to 20 questions per day. Rounds of Daily Quiz with Spaced Repetition: Test your memory every day by doing 1 round of Picmonic’s Daily Quiz with Spaced Repetition! Our algorithm will take what you’ve learned with our Multiple Choice Questions, and intelligently quiz you on the facts you need to review, right when you need to review them. Search or Browse all the Picmonics within your area of study: No matter what you’re learning with Picmonic, you can browse everything we have to offer. Most importantly, all our Picmonics are sorted into categories so that you can easily find what you’re looking for. Picmonic Pathways cover Courses, Body Systems, Books, and Board Exams or the NCLEX®. Each Pathway is composed of the Picmonics relevant for that topic, and you can quickly view the facts associated with each Picmonic in the Pathway. Join over 500,000 students who are learning visually and check out Picmonic Free now! Ready to level up your learning with Picmonic Premium? • Plus everything else Picmonic’s innovative learning system has to offer. You’ll be able to learn to your heart’s (and brain’s) content. Invest in your career and give yourself the edge! Click below and select your area of study to view plans and pricing! View more Picmonic Reviews here.